The Col du Galibier is an intimidating climb. The road lays out in front on you visually hinting at what lies ahead. It is the kind of climb where you say in your mind, "this is going to hurt, for awhile, then it will be over". Well I didn't know how much it truly would hurt. 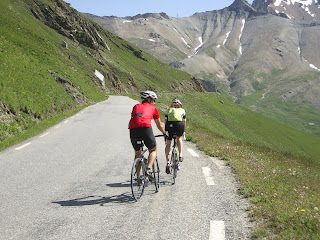 I can honestly say that the only time I have ever bonked was coming back over the Col du Galibier in 2007. I had already gone over it once, I had to get myself back, it was the getting back that wiped me out. Whenever someone tells me a story that includes the phrase, "I bonked," I can react with a knowing, "oh no," and truly understand what they mean. 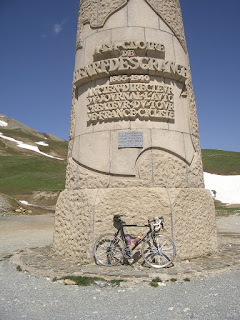 There I was in the middle of one of the most majestic climbs in the French Alps, well aware of it's history, drama and effort required, unaware that I was about to experience my own drama. 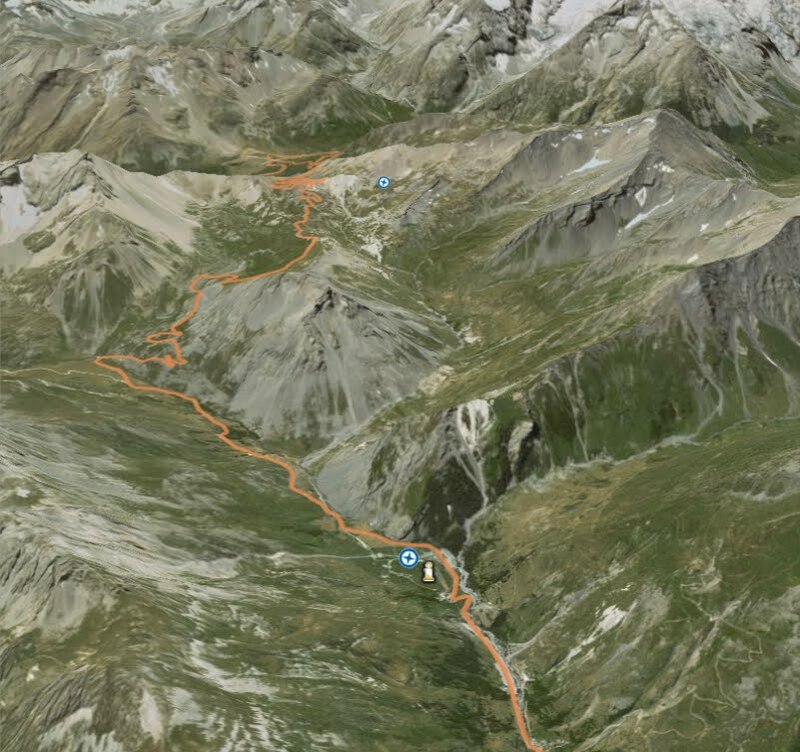 It was our third hard day of climbing in a row, we had started from the Col du Lautaret, reached the top fairly easily and descended into the town of Valloire. We scrambled for lunch in a town mostly closed in June. We started the long climb back to the summit from the east side. And I bonked! Not just a little hunger knock, an all out bonk on the switchbacks near the top. Every one of those last switchbacks is now ingrained in my mind. My body had nothing to give, but I was fully aware that I had to keep going, that I had to get myself back. 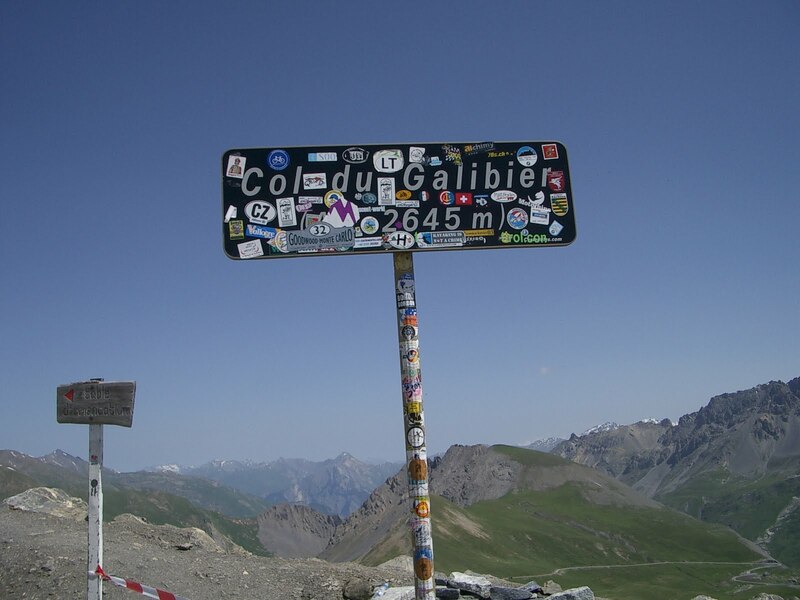 My mind climbed the Galibier that day, my body could not. My brother Michael stayed with me at every turn mostly saying nothing, simply letting me know he was there. I made it to the top exhausted from the experience. I almost cried when we found the car at the bottom of the Col, it was an elation like non other. 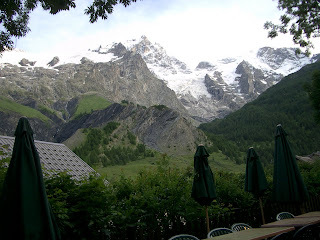 This is the view of the Glacier in La Grave where we stayed nearby. Looking down from the west side of the Col du Galibier onto the Col du Lautaret. 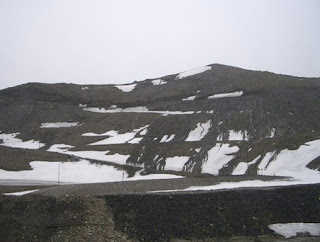 (The road up to the Col du Lautaret from La Grave is a busy highway, under construction at the time of our visit). The climb up from the Col du Lautaret to the summit of the Col du Galiber (riding with my brother Michael) was relaxed and beautiful. We pretty much looked at the scenery the entire climb. I remember people cheering me on because they thought it fantastic to see a woman climbing on a bike. At the Henri Desgrange monument at the summit of the Col du Galibier. A storefront in the town of Vallorie. 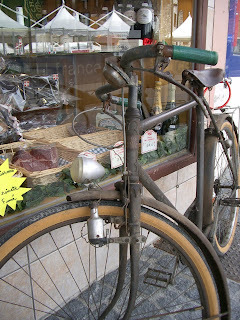 I loved this old bike. 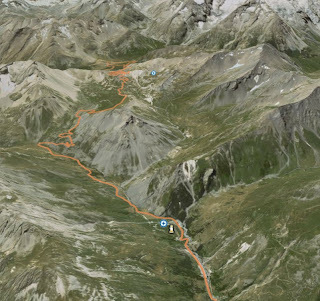 Somewhere on this curvy line, before the top blue dot, I bonked on the way back over the Col du Galibier from Vallorie. 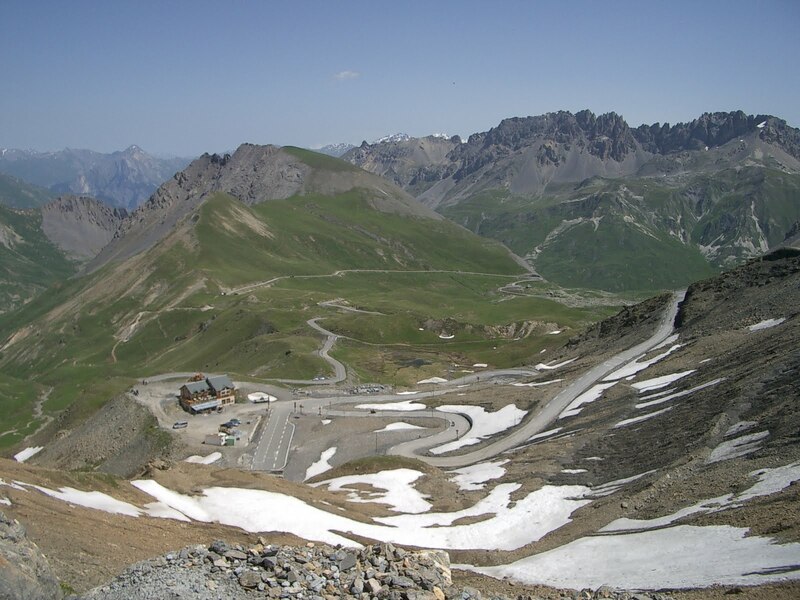 The switchbacks of the east side of Col du Galibier. But I managed to see this sign for the second time in the day (in a daze of bonkdom). 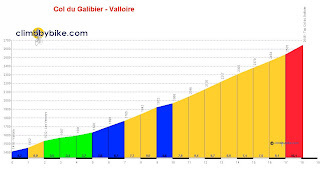 Col du Galibier East side profile Vallorie. It was only 54km, but when you bonk, you bonk! The next day we had a lovely picnic next to this river (on the back side of Les Deux Alpes) (this is my sister-in-law Suz). What a wonderful way to spend a well-needed rest day. 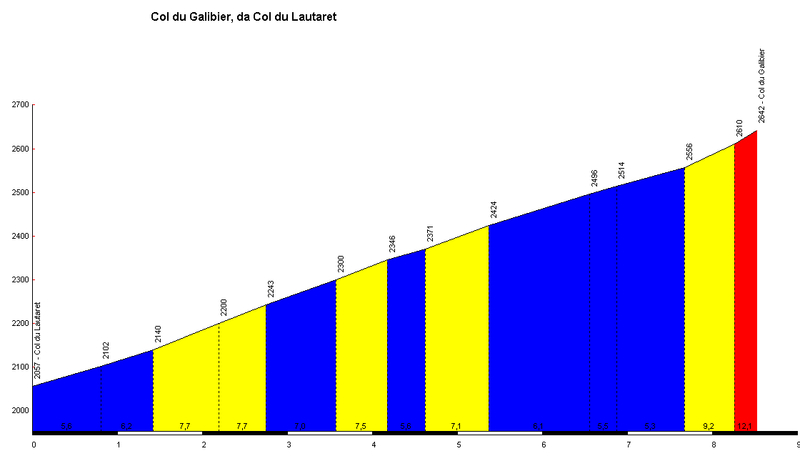 Some fun information about profiles, video and map of the Col du Galibier can be found at Cycling Challenge . Climb by Bike - Col du Galibier profile page. The GrenobleCycling.com page for the Galibier. Read more: an article by VeloNews.com Le Galibier The Sacred Monster.